Supplements: Should I take an antioxidant supplement? It’s been a wild week of getting a few clients started on their healing journey. Thanks for joining me here again at Wellspring. I will be posting reviews and recommendations consistently for who should take what supplements and how you can find out if you need it. Looking forward to weeding through the good and not-so-good with you! If there is a supplement or class of supplements you would like me to speak to please leave a message in the comments below. So….Antioxidants.Do you need them? Antioxidants are found in some foods. Citrus peel and organic berries are my go to. Best bang for your nutrient buck between those two. Then, there are the heavy hitters – food grade antioxidant powders. Do you need them? You’ll almost always get this answer from me when asking my opinion if you should take something – It depends. 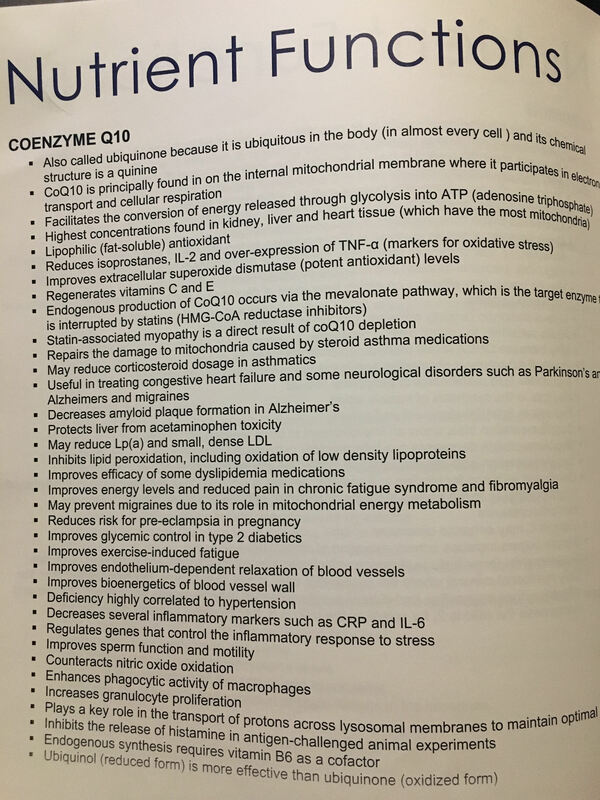 If you have any of the following conditions or symptoms, testing your antioxidant levels is recommended: ADHD, brain fog, adrenal fatigue, anxiety, asthma, autism, depression, diabetes, dyslipidemia, estrogen dominance, phase I or II impaired liver detoxification, fatigue, female or male infertility, fibromyalgia, GI symptoms, headaches, hypertension, hypothyroidism, inflammation, methylation issues, sleep apnea, impaired athletic performance, shortened telomeres, low testosterone, and weight management difficulty…you know, just to name a few. One sure way of knowing if you will benefit from or need supplemental antioxidants is to test your levels with a micronutrient panel. The one I use is the Spectracell Micronutrient panel. It’s the gold standard in the functional health world for nutrient testing. Not an expensive panel to run either…a plus! Two things to test: Spectrox and specific antioxidant values. Both of which the spectracell micronutrient panel tests for. Spectrox is a marker that measures total antioxidant function. The percentage value gives a total antioxidant and immune function measurement, not just two specific values. Its so cool! It measures the ability of cells to withstand attack from free radicals and other oxidative stresses (antioxidant reserve). 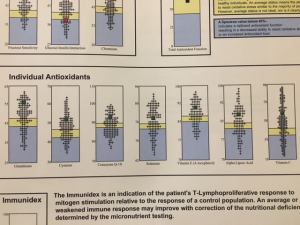 The other group that should be tested are the specific antioxidants. 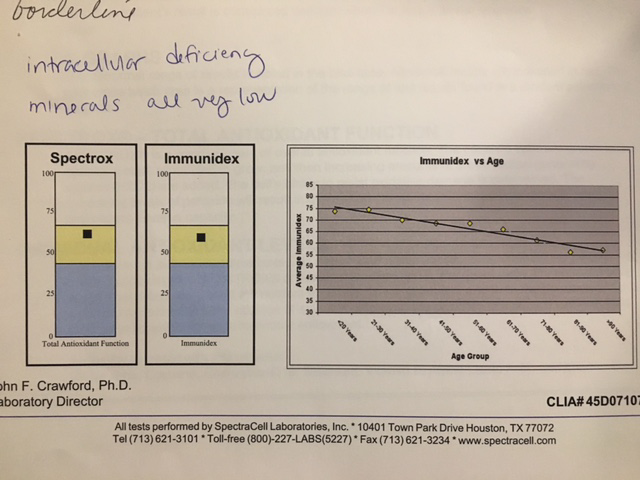 BUT, and that is a big but..If these levels are borderline or a functional (severe) deficiency supplementation is a must. Obviously, it needs to be tailored to what that specific individual is deficient in. If there are antioxidant deficiencies and Spectrox total antioxidant function is suppressed, a broad spectrum antioxidant powder should definitely be used. You have to be careful here and choose wisely. There are plenty of “greens powders” that promise ultimate health but are actually contaminated with metals and gut irritants. Buyer beware! Rest assured, I have done some research for you. Surpised? Here is the product I can recommend for you. This is not an affiliate and I don’t own stock in this company. I just trust them and use it for my own family. I’ve searched high and low for the highest quality and most safe supplements when needed. 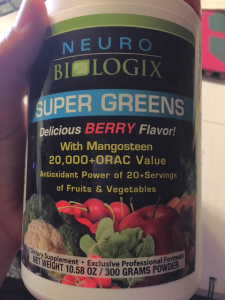 Neuro Biologix Super Greens are one of the best choices. I love the berry flavor, but the kids love the chocolate. We simply add a scoop to a smoothie. Click here to browse for yourself. 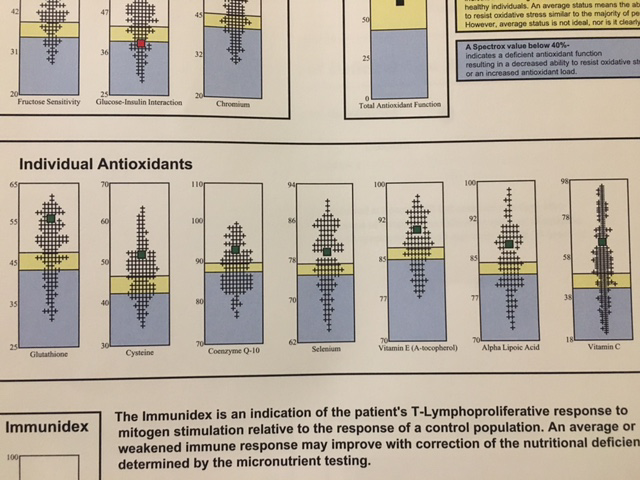 I would love to post all the functions these antioxidants were involved in but I would need about 5 hours to type that up for you, non-stop. I think what would be helpful and something i plan on doing is focusing on one nutrient per post, it’s role, importance and deficiency symptoms. 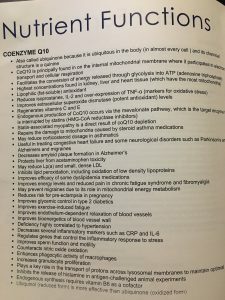 Just to give you a taste, here is an example of all of the nutrient functions of just one antioxidant – Coenzyme Q10. Incredible right?! Because my “blogging photoging” skills need some work, let me make it easy on you and summarize what CoQ10 does: powerful antioxidant that stops oxidation of LDL cholesterol, important in energy system production, key to heart, liver and kidneys. Important? I’d say so. Antioxidants are not just about aging well. Take a moment, do a mind/body scan. Are you experiencing any of the symptoms or conditions listed above in the beginning of this post? It may be time to have your levels tested. Personally, I’m working on getting my suppressed glutathione levels up and will continue to supplement with NAC and greens powders until I can get myself in an acceptable range. 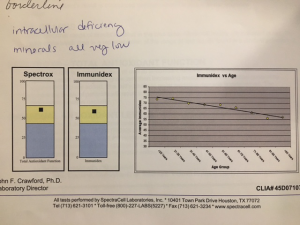 Contact me if you would like help determining if you would be a good fit for micronutrient testing. What greens powder do you take? List it below in comments and I’d love to help you determine if its a wise choice or a straight up waste of money.